Located in northern Europe, Denmark is the smallest Scandinavian country. The Nordic nation with more than 5,7 million inhabitants consists of the Faroe Islands, Greenland and Denmark. Approximately 70 of all Danish islands (about 406 in total) are inhabited, with Zealand being the most populated one. Germany is the only neighboring country, while the Øresund Bridge connects Denmark with Sweden. 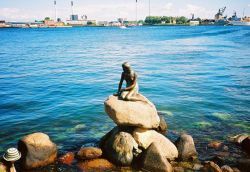 The Round Tower is probably Denmark’s most famous landmark, while the Little Mermaid statue in the capital of Copenhagen is another renowned symbol. Denmark is also famed for its delicious pastries, and the residents benefit from free healthcare and education. All games of chance are legal in the small Nordic country, and in 2012, the government of Denmark liberated the gambling market. However, the state-run company Danske Spil remains the leading provider of lottery games, in addition to betting on animal races. Danish gamblers have a weak spot for slot machines, of which there are approximately 26,000 across the tiny Scandinavian nation. Online casino gambling also enjoys a high degree of popularity, and the Danish Gambling Authority (SKAT) grants licenses to operators. Although the government tries to block unlicensed gaming sites, it’s nearly impossible to prevent locals from enjoying their beloved pastime on those platforms. Indeed, Danish gambling fans have no difficulties playing at unlicensed online casinos. The powerful economy of Denmark is characterized by its small domestic market, including a high-tech agriculture sector. Its labor market is known as one of the freest in Europe. The small Nordic country depends heavily on trade, with Germany being its most important trading partner. After two years of contraction, the Danish economy returned to growth in 2014 (+ 1.3 percent). Last year’s expansion slowed to 1.2 percent, while the European Commission expects a 1 percent growth rate in 2016. Danes benefit from a high standard of living, despite one of the highest tax rates in the world. Additionally, the population enjoys high incomes (one of the highest in the EU), although the price level is 37 percent above the average of the 28 member states. Unemployment continues to drop, with an expected 5.9 percent next year, followed by a 5.6 percent rate in 2018. Additionally, the poverty rate of nearly 6 percent is well below the 11.3 percent average of the OECD countries. With nearly 5,5 million internet users, Denmark’s penetration rate has increased to more than 96.3 percent. It goes without saying that more and more Danes connect to the world wide web through mobile devices, including tablets and/ or mobile phones. If you add the craze for gambling, it doesn’t come as a surprise that online gambling is so popular in the ‘land of Hans Christian Andersen’s fairy tales’. How to deposit money in an online casino when I’m from Denmark? Curious to enter the fascinating world of internet gambling after reading our “online casino Denmark” page? Claim a 100% first-deposit bonus at Royal Panda.